Based in Santa Rosa, California, the offices of Peter E. Goldbeck, Attorney at Law, provides strategic representation to clients who face a range of important legal issues. Attorney Goldbeck is backed by nearly 30 years of experience in the Santa Rosa legal community and has a strong track record of protecting his clients' rights while obtaining favorable outcomes. Medical marijuana: Establishing a medical marijuana collective is a complex process governed by ever-changing interpretations by courts and law enforcement. Our firm offers practical advice to help ensure these legal entities are protected from criminal prosecution. In addition, we offer ongoing legal support to address any issues that arise after formation. 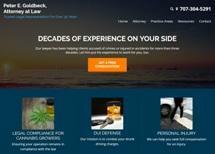 Attorney Goldbeck is a leader in this niche area of law and an active member of NORML. Criminal defense: From misdemeanors to felonies, our firm provides aggressive criminal defense representation for those charged with a wide variety of crimes, including marijuana possession or cultivation and DUI offenses. A primary goal is to help you mitigate the consequences of your charge. Personal injury: The legal team at Peter E. Goldbeck, Attorney at Law, is fully committed to helping personal injury victims obtain financial compensation for their medical expenses, lost wages, pain and suffering, and other damages after an accident. Focused on maximizing settlements and verdict awards, we also offer caring and responsive client service during this time of great difficulty. Whether you face a legal issue involving medical marijuana, criminal law, or personal injury, we invite you to contact our law firm for a free initial consultation. All personal injury cases are taken on contingency, and we offer a competitive fee structure for all other clients.